From left, Rich DuPont, Manny Santos and Ruby Corby O’Neill in Torrington City Hall. 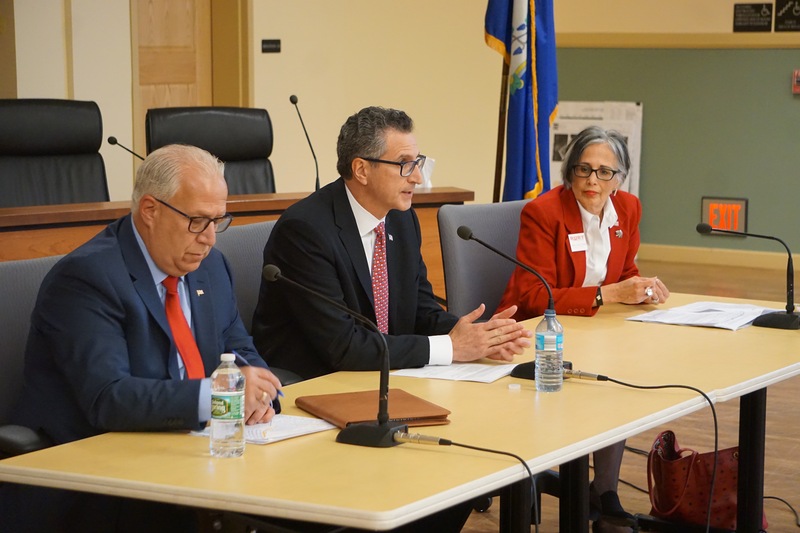 Torrington — The three Republicans seeking the open seat in the 5th Congressional District glided through a one-hour debate Monday night without disagreeing on President Trump’s approach to immigration or trade, two of the most contentious issues dividing Democrats and Republicans in Washington. Manny Santos, Ruby Corby O’Neill and Rich DuPont all expressed sympathy for the Dreamers, the immigrants who arrived in the U.S. illegally as children, saying they detected the same sentiment in the president, despite a polarizing fight over separating adult immigrants from their children when taken into custody. Two of the three, Santos and O’Neill, are immigrants who say their families entered the U.S. legally, Santos from Portugal and O’Neill from Honduras. All three said they support the president’s insistence that U.S. border security is compromised and the nation’s immigration policies are flawed. “I personally do not believe that children who come here with their parents, that have no choice on where they are going, who are going to school, who believe they have an opportunity, are staying out of trouble, deserve to be punished,” said DuPont, a businessman who says legal immigration is necessary for an adequate workforce and vibrant economy. Santos, the former mayor of Meriden who won the endorsement of the GOP convention in May, said Democrats are to blame for the polarization around immigration, not Trump. “It’s a serious issue that, quite frankly, our opposition on the Democratic side use as a wedge issue,” Santos said. O’Neill, a retired college professor, noted that Honduras is among the struggling Central American nations whose residents are fleeing poverty and violence by heading north through Mexico to the U.S. Her family left Honduras for the U.S. when she was nine-years old. O’Neill said the U.S. is a generous nation on immigration, extending legal status to one million immigrants annually. The statistic is accurate, though it does not mean the U.S. allows one million people to legally enter the country every year. About 600,000 of the one million are immigrants already here who are granted legal status. The open race for the 5th District, the result of U.S. Rep. Elizabeth Esty’s sudden decision to end her campaign in April over criticism of her handling of a harassment complaint against her chief of staff, has generated primaries in both parties. The western Connecticut district is the state’s most competitive, but it has been in Democratic hands since Democrat Chris Murphy unseated Republican Nancy Johnson in 2006. Running from the Massachusetts line to Danbury on the New York border, the district includes Newtown, the scene of a horrific school shooting that has helped make Murphy, now a U.S. senator seeking re-election to a second term, a national spokesman on gun control. Both Democrats seeking the congressional nomination, Mary Glassman and Jahana Hayes, stand with Murphy on guns. Without criticizing the specifics of any gun control law or proposal, all three Republicans said they would offer gun owners a clear choice in the fall. “We’re pro 2A,” O’Neill said, referring to the second amendment. All three support the president’s controversial approach to welfare. In April, Trump signed an executive order intended to force low-income recipients of food assistance, Medicaid and housing subsidies to join the work force or face the loss of benefits. Santos said he would not cut any lifelines for the truly needy, but the majority of people on welfare are able to work. “I think it’s very clear it’s my position we should have work requirements for able-bodied people,” O’Neill said. DuPont took a similar view on a question about the Affordable Care Act. Rather than rely on government, a growth in private-sector jobs with health benefits would be preferable to overhauling the ACA, he said. None offered an opinion on specific issues pertaining to the Affordable Care Act, such as whether they support the Medicaid expansion undertaken by many states, including Connecticut. “It’s really nice to finally have a president who fights for us,” O’Neill said.